RLPy is a framework for conducting sequential decision making experiments that involve value-function based approaches. It provides a modular toolbox, where various components can be linked together to create experiments. Agent: This is the box where learning happens. It is often done by changing the weight vector corresponding to the features. Policy: This box is responsible to generate actions based on the current states. The action selection mechanism often dependends on the estimated value function. 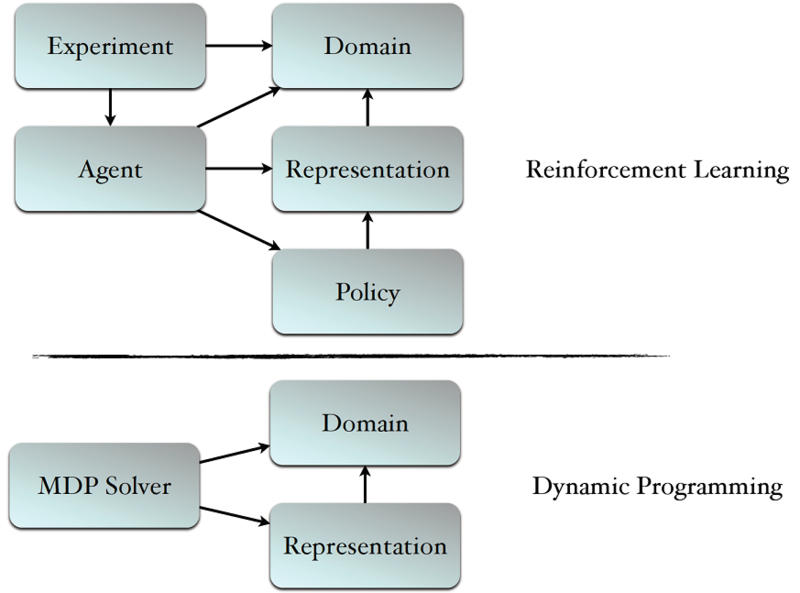 Representation: In this framework, we assume the use of linear function approximators to represent the value function. This box realizes the underlying representation used for capturing the value function. Note that the features used for approximation can be non-linear. Domain: This box is an MDP that we are interested to solve. The Experiment class works as a glue that connect all these pieces together. Representation: Same as the RL case. Notice that the Value Iteration and Policy Iteration techniques can be only coupled with the tabular representation. Domain: Same as the RL case. The project was partially funded by ONR and AFOSR grants. Feel free to join the rlpy list, rlpy@mit.edu, by clicking here. This list is intended for open discussion about questions, potential improvements, etc.